does that jet lightning (or the sprites) make any sounds, like thunder??? Most likely, yes. But the altitude that most sprites occur is so high, the sound wave may be lost. If it does reach the ground, it is likely lost among the sounds of thunder from normal lightning strikes. Hmm, not sure, but they might! They're absolutely humongous", after all. Oh, another one was just posted at the Atmospheric Optics subreddit. that is inspiring me to keep a look out for these puppies. just to see one would be great! Pilots and astronauts had reported seeing sprites for decades, but the reports had been dismissed by meteorologists until astronauts on the space shuttle finally recorded one on video in 1989. Even then, the recording was accidental as they were trying to record a rocket launch on the horizon. 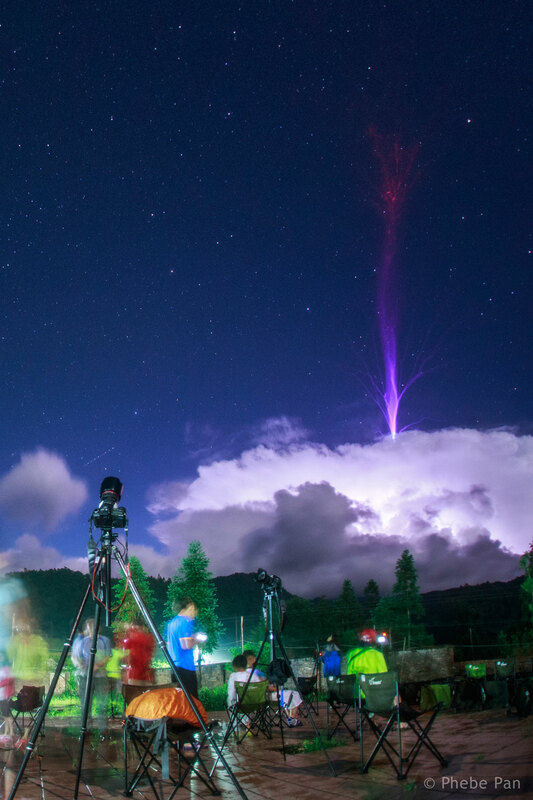 Since then, researchers have had great success in recording "Upper-atmospheric Lightning" in recent years. One researcher took advantage of the mountains in Colorado, sitting high in altitude so he could look over the horizon and see the tops of storms in Kansas. He was greatly successful in capturing multiple images of sprites and jets. There are several different types of upper-atmospheric lightning. I have not yet heard a definitive explanation on what generates these discharges into the upper atmosphere. The image posted above was taken by Phebe Pan on August 13, 2016. The other picture mentioned was taken by Ken Luo. The discharge is officially labeled as a "Gigantic Jet." Interesting. Note how as the bolt ascends things get strange. Lightning normally resolves the difference between a negative charge on the clouds and positive charge on the ground through normally non-conductive air by ripping some electrons off of some nitrogen and oxygen molecules and making plasma. Once you have charged particles that are free to move you have a conductor and electrons can flow down that path to ground. Here as you move into the upper atmosphere the molecules to rip apart to make plasma get further and further apart making an interesting visual effect.